This kitten was rescued by two friends on the road to a concert one day. The little baby was about 5 weeks old and they couldn't exactly tell if it was a boy or a girl. What they did know, though, was that the poor baby was covered in fleas. How about a parrot petting a cat next, please. Oops! Somehow I totally forgot about Two Cats Tuesday yesterday, so we're doing Two Cats Wednesday instead! That's OK, right? I hope so, because this one is really cute! 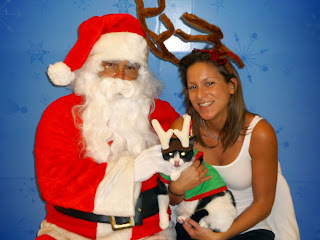 I took Moo to visit Santa this weekend! It was his first visit to Santa (it's his first Christmas officially as my cat -- last year he was just starting to make his case on my back porch for me to bring him in). 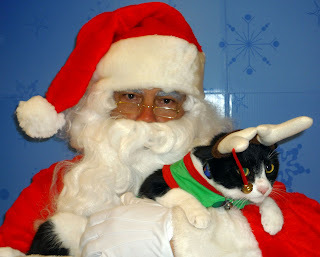 Moo was such a good boy with Santa! 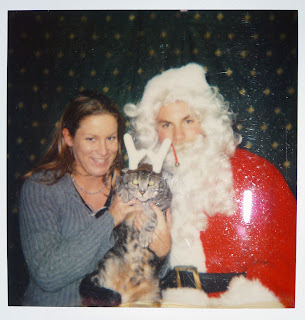 I was worried that he'd either raise hell and claw me all up trying to get away from him or that he's be just scared stiff and cling to me when it was time to sit with Santa. He did neither! He was the BEST boy. Me, Moo and Santa! Click on it to biggify... that's him licking his nose at the exact second of the picture. Silly Moo. You will bring me LOTS of treats for Christmas or else I will get you with my laser eyes! 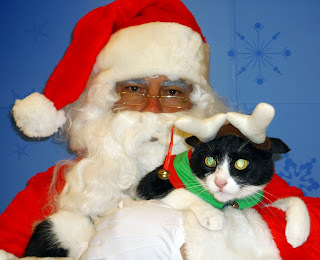 Wondering where Pimp was for this Santa visit? Well... Pimp has taken to making his dislike for travel known in a couple ways, better known as #1 and #2. I figured Santa would not appreciate having #1 or #2 on his lap, so Pimp stayed home this year. He has been plenty of times in the past though! Here are some pictures of his past pictures (sorry about the quality -- I literally took pictures of the pictures!). 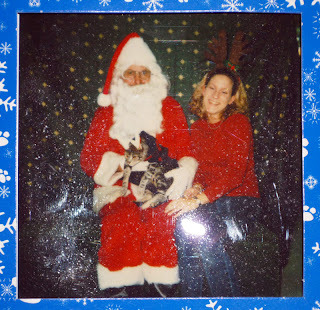 I think this was one of our first visits with Santa. Pimp looks little here (and I look ridiculously young). In this one Pimp's sporting his big Santa hat. Big hat means bigger presents, right? 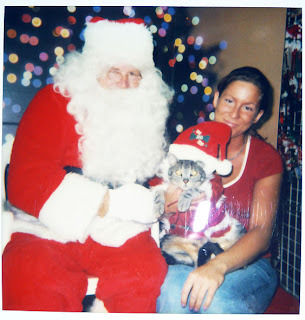 Here's a more recent one of Pimp and Santa... Look at that belly! I love how it's brown. Meet Steve McQueen, MacGyver cat. The info with this video said this is the intro to his TV show... and we can only hope that one day he really will have a show! But I wonder if he can fix an engine with a paper clip and a stick of gum... (or maybe a hairball and a little cat nip?). Want more TV kitties? 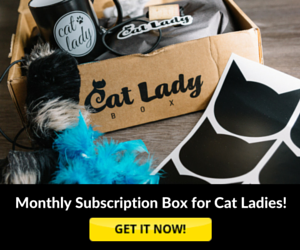 Check out Wilbur the cat's episode of Cat Cribs. Show of hands: How many of you keep your cat's treats in a jar thinking they won't know how to open it? All of you raising your hands? That's what I thought. 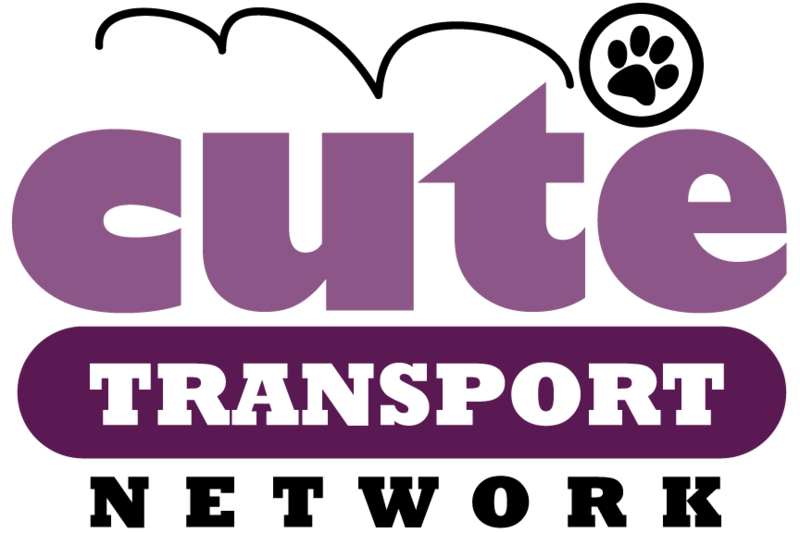 Note from Cute: We're soooo close to our goal for Santa Paws Drive! If you haven't already heard, me and a couple friends started a charity drive to raise toys and money for shelter animals for Christmas. We just need a few hundred dollars to reach our goal... If you have can spare any pocket change, we'd appreciate the support!